» Post office in former Safeway? 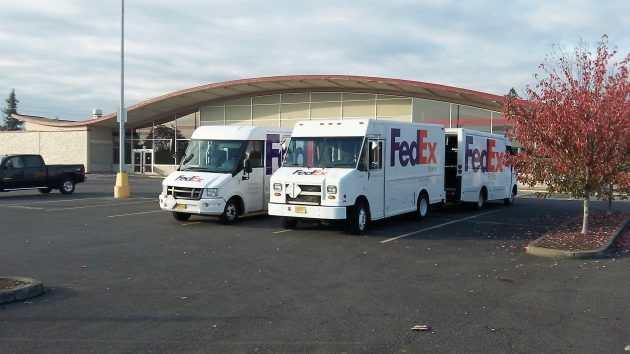 FedEx trucks huddle at the old Safeway building in this file shot from October 2015. 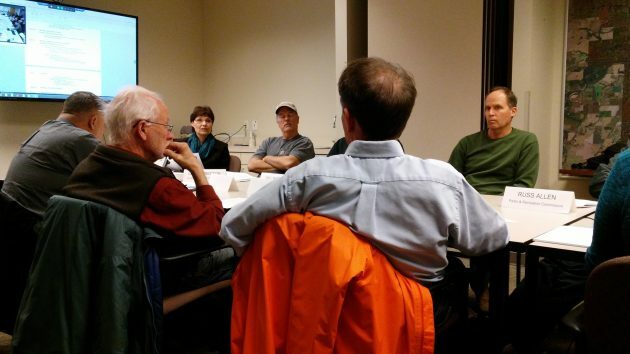 The occasion for musing about moving the post office from its downtown block was Monday’s meeting of Mayor Sharon Konopa’s “Historic Properties Ad Hoc Work Group.” The panel thought it should come up with a number of potential sites before approaching the Postal Service about the possibility of moving. Committee members think that the post office might be amenable to finding new quarters because its parking lot can’t handle the demand during some periods of the day, and parking in the vicinity is likely to get even harder when the Albany Carousel Building opens across First Avenue this summer. The mayor said the Postal Service would probably want $1.1 million, roughly the value the Linn County assessor has assigned to the property, at 525 Second Avenue S.W. After leasing it since the 1960s, the service bought the square-block — between First and Second and Washington and Calapooia — in 2010 for $34,065. The former owners still owe about $15,000 in unpaid property taxes and interest from tax year 2010. Safeway closed the store in 1999. For several years it kept its lease, but by 2015 the lease was off, and now the company no longer has anything to do with the building, owned by the Kampfer Family Limited Partnership, Harrisburg. The site lies within the Central Albany Revitalization Area, raising the possibility that getting the post office to move there might involve the spending of urban renewal money — for buying the postal property plus fixing up the new quarters, which the committee seems to think the Postal Service would want to lease. The city staff plans to search for other possible sites and also research the facility needs of other post offices of similar size before the next meeting of the mayor’s work group on April 24. Also Monday, the panel narrowed to one or two the potential sites for moving the city-owned former Cumberland Presbyterian Church as a public meeting space available for rent. The leading site is city-owned property near Hackleman Park and the skatepark there. Also still in the running, but barely, is city-owned property within the Edgewater Village development off Water Avenue. The panel voted to discard Swanson Park as a possible site. Committee members dropped the idea of going out once again for bids by private parties to buy the church and move or restore it. I love the idea of using the old Safeway building for the post office. It’s great when we can reuse buildings. Looks like a win win for both parties. The Post Office will relocate. The merry go round will fit in the old safeway and there is plenty of parking. Why don’t they move into the vacant building that the Post Office built and only used for a short time on Ferry St???? It’s been sitting vacant and for sale for years!!!! The Postal Service leased this building for 20 years and are still paying $10,000 a month in rent!!! Here’s a story from 2009! The link you posted Hasso won’t work. Postscript: Because a kind reader pointed out what I had done wrong (see below), I fixed the link. There is a tenant leasing Ferry street post office location. The building on ferry street is not vacant, a business moved in about a year ago. People using public transportation might also do additional shopping when downtown while killing the hour they have to wait for the bus to come by again. What shopping would they do at the Safeway location? That seems to be quite opposite for the “alleged” purpose of CARA. Good Luck getting access to Pacific Blvd. I guess that either the state or the city of Albany has fixed the zoning and/or access to Pacific Blvd so that there is a zero probability of any business locating to that location. My thoughts exactly. The amount of traffic into and out of (only) two closely spaced entry/exit points would be a nightmare IMHO. I support the Carousel and I support some of the projects CARA has done, but this idea of ludicrous. The Post Office must stay where it is, in the heart of the downtown, where people and business use it frequently, many walking to it as it is so convenient. The Carousel knew about the parking situation and the post office when they proposed to put it where it will go. They can co-exist, and they should co-exist. If more parking is needed, the city needs to look at alternatives. But in any case, it’s jumping the gun a bit to spend any further money on the parking situation until we know what traffic the Carousel may attract. There are alternatives. Nearby, even if not directly across from the Carousel. The City Council has too much money at their disposal. They’re talking about spending a third of a million dollars to move and restore an old building when our water taxes are going up and up. And up. We need to do something about this at the next Council election(s). Why do they want to save that church so badly? I know they spent money on it, but wouldn’t it be best just to tear it down? Moving it sounds insane. This building would be a perfect vintage roller skating rink.